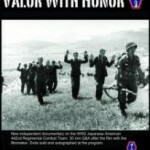 SAN JOSE — Burt Takeuchi’s documentary “Valor With Honor” will be screened on Sunday, April 29, at 2 p.m. at the Martin Luther King Library on the San Jose State University campus. Three years in the making, this documentary is based on over 35 interviews of Japanese American veterans who served in Europe with the 442nd Regimental Combat Team, the most decorated American military unit for its size and length of service. The 85-minute feature film describes the harrowing stories of 442nd’s battles in Italy, the rescue of the “Lost Battalion” in France, the assault up Mount Folgorito, and the liberation of the Dachau death camp in Germany at the close of World War II. The veterans also discuss their bittersweet return home to America. There will be a Q&A after the screening with the filmmaker, and DVDs will be sold and autographed. For more information on the film, visit www.valorwithhonor.com.